The Cavalli Club located in the Fairmont Hotel in Dubai is a classic luxury restaurant and club. The stylish venue is decked out in Swaroski crystals and chandeliers making it a very chic party spot. The entire club was created in collaboration with Roberto Cavalli, the famous designer whose name the restaurant and club uses. 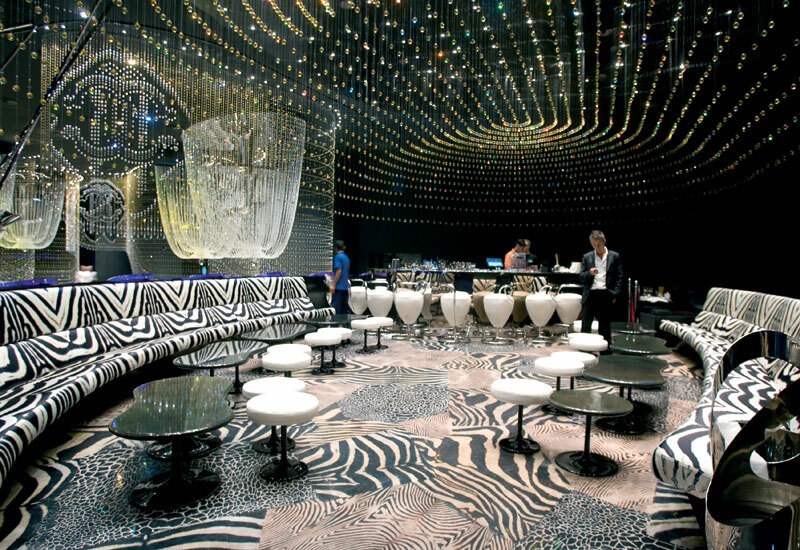 The interior of the Club showcases design elements that are typical of Cavalli and include animals prints. The fashionable venue is a spot where the elite of the city mingle and come to enjoy food, music and dancing. The Cavalli Club transforms as the night progresses and start off as a high end restaurant. As the night wears on they staff quietly converts the interior into a lounge and eventually into a club. - The venue has great food and customers can relax in the cool ambiance as they order off the menu which includes mostly Italian cuisine and international fusion cooking. - The drinks at the club are exceptional and the cocktail menu is great. The Cavalli club also caters to individuals with refined tasted and offers vintage wines and liqours. - The club is a wonderful experience and the DJ or Guest DJ from around the world spin amazing hit tracks late in to the night. The club has a dress code of smart casual and is open seven days a week but is closed during the month of Ramadan. Timings are from 8:00 p.m. to 3:00 a.m daily. The World Trade Center Metro will drop commuters off only a few meters away from the Fairmont hotel that houses the Cavalli club. From the metro stop travelers can head south west towards 308th street. Once they reach 308th street they will make a right and find the venue on the right. View Map. Th hotel has a bus stop right in front of it named the Fairmont stop which can be reached by using bus 98E. After getting off visitors can go in a south west direction and find the hotel on their left. View Map.